As soon as I saw this image of ‘Life begins at 60’ I knew I had to find this old photo. Always loved books and trees. I go on enough about books. 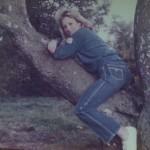 Here is proof of my love of trees.